The September Consumer Price Index numbers are out. Inflation is really a sustained general increase in the level of all prices. Since the price index itself can be rather noisy, varying a lot from month-to-month, many economists use some different techniques to smooth out the trend to see what the “sustained” action really is. Three of the most popular ways of smoothing out the noise are called core CPI, median CPI, and trimmed-mean CPI. In all three cases, the signals they are sending are not encouraging for recovery. We are not yet into true deflation territory where prices are actually falling instead of increasing, but we are very, very close. Both deflation and high inflation are undesirable. But the risks are not symmetric. Even very small amounts of deflation can be difficult to eliminate and can easily push an economy into a very prolonged period of stagnation or decline. Inflation, on the other hand, can be more easily brought down if it gets too high. Further, inflation at low levels, such as 2-4% isn’t very harmful at all. In fact, a case can be made that 2-3% inflation is much more desirable than no inflation. I like to think of managing inflation/deflation as driving down a desert road at the edge of cliff. On the deflation side of the road is steep cliff with no guardrail. On the inflation side of the road is a desert strewn with rocks. Messing up and getting into inflation will get rocky and messy, but it’s manageable and survivable. Erring on the side of deflation and things get real bad, real fast. Best to leave a little margin of 2-3% inflation to make sure there’s no accidental plunge into real deflation. For more than a year now, we’ve been playing daredevil with our economic futures by getting way too close to deflation. …these three measures: core CPI, median CPI and trimmed-mean CPI, were all below 1% in September, and also under 1% for the last 12 months. 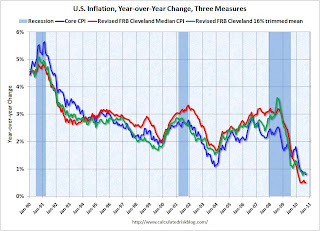 This graph shows these three measure of inflation on a year-over-year basis. They all show that inflation has been falling, and that measured inflation is up less than 1% year-over-year. Core CPI and median CPI were flat in September, and the 16% trimmed mean CPI was up 0.1%. One last note about these numbers. When The Fed increased it’s balance sheet dramatically two years ago to help bail out the banks and stabilize the financial system, the Austrians, Monetarists, gold bug types, and general austerians all complained that The Fed was leading us into a hyperinflation. When the federal government budget blossomed into multi-trillion dollar deficit in early 2009, the same people warned us that it would lead to hyperinflation. Now, 20-24 months later, we can conclude they were wrong. Their models are wrong and therefore the policy advice is wrong. Deficits do not lead to hyperinflation when you have double-digit unemployment. Period. …When it comes to wealth and taxes, the vast majority of Americans are modern Know-Nothings. The disconnect between belief and reality is being exploited by those who laugh all the way to the bank with their tax savings and the burdens they have subtly shifted off themselves and onto the rest of us. The ideal wealth distribution chosen by the 5,522 people who took the online survey has the top fifth of Americans owning between 30 percent and 40 percent of the wealth. Instead those surveyed were shown pie charts and asked what they thought was the ideal distribution of wealth and what they estimated to be the wealth distribution in America. They were not told that one of the pie charts was Sweden’s actual wealth distribution, but people gravitated to it like moths to a flame. What did those surveyed think was the actual distribution of wealth in America? The actual United States wealth distribution plotted against the estimated and ideal distributions across all respondents. In the “Actual” line the bottom two quintiles are not visible because the lowest quintile owns 0.1 percent of all wealth and the second lowest quintile owns 0.2 percent. Source: Norton and Ariely Survey.They estimated that the top fifth of Americans owns about 60 percent of the wealth. So what about the bottom 120 million of us? Those surveyed said that ideally, the bottom 40 percent would own 20 to 25 percent of all wealth. When asked to estimate the share of wealth actually owned, the collective guesses were between 8 and 10 percent. BTW: Sweden isn’t really “socialist”. It’s more of a social democracy. “We’re not evicting people who deserve to stay in their house,” James Dimon, J.P. Morgan chief executive, told analysts Wednesday. HOLT – Army National Guard Capt. Bill Krieger was talking to his wife, who’s stationed in Iraq, at the very moment his mail carrier came to his Delhi Township home Saturday with a registered letter requiring Krieger’s signature. Let me pause here to inject a little background into this story. Capt. Krieger served in Iraq in 2006-07. His wife, Army National Guard Sgt. Kristin Krieger, is there now, as is their 21-year-old son, Pfc. Aaron Krieger, who’s regular Army. They keep in touch via Skype, software that allows voice calls over the Internet. Let me point out, furthermore, that JPMorgan Chase is one of the banks American taxpayers bailed out in 2008. Chase is currently under investigation for its alleged sloppy approach to foreclosures. Oh – and one other thing … since they bought their house five years ago, the Kriegers have never missed a payment. Not one. Mr. Dimon’s assertion that all foreclosures deserve it is demonstrably false. He is either lying or ignorant. If ignorant, then we can conclude that the organization he heads, JP Morgan Chase, is our of control and cannot account for it’s own assets properly and report them properly. Either way, it’s FAIL on the bank. Unfortunately, Mr. Dimon will not only not suffer consequences for his and his bank’s misbehavior, he will be rewarded with hundreds of millions of dollars in bonuses. We need a new banking system. He has asked agencies to develop plans for cutting budgets by 5% percent. But how that would be accomplished would be decided on a case-by-case basis, he said. “In some cases, they may say we don’t need to fill vacancies,” he said.